If I had a photography motto it might be “follow the crows.” As sentries of the canopy, crows know what’s going on. So I pay attention. If it mattered at all to crows, they could tell me who shattered my car window last month and who stole our Christmas tree (with decorations) back in 1995. What obviously does interest crows is those pesky interlopers, especially during prime nesting season. Around here, that interloper is most often a Bald Eagle. But on this particular afternoon, I heard the crows calling out back where eagles don’t generally fly. It’s a private driveway for an apartment building. And it’s also dotted with nesting trees for crows, jays and squirrels. When I hear bird distress calls from that zone, I assume fledgling trouble. I love seeing raccoons in daylight, just to observe the behaviors which normally evade us at night. Contrary to popular mythology, seeing a raccoon in the daytime does not mean they are rabid. 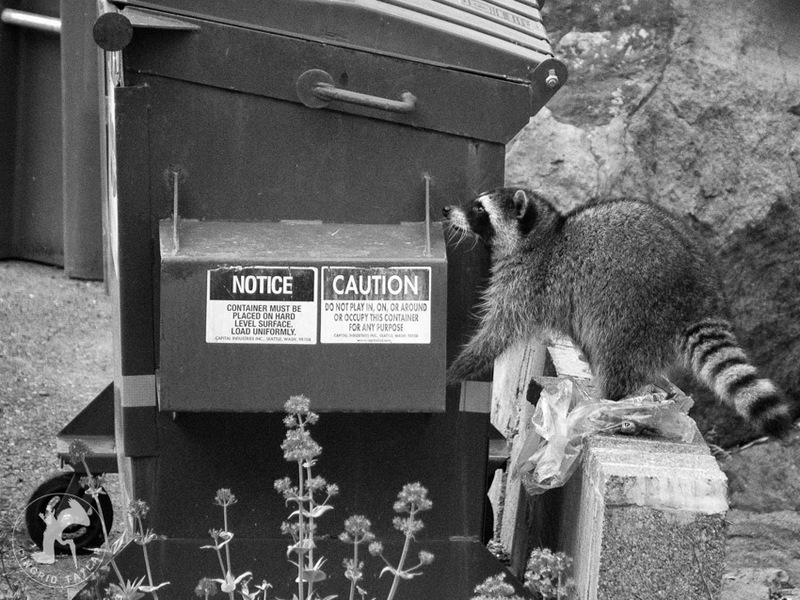 Raccoons can carry rabies, but animals with rabies exhibit other symptoms. This time of year, we see raccoons even more often in the afternoons as they forage, often to support a growing family of kits. Mother raccoons will look after their young for a year or so. You may or may not know that little kits purr — like cats. We learned this when we hand fed babies at our wildlife hospital. They chirp and screech a bit, too — they can be noisy. If you turn the volume up, you can hear the purring sound in this video from a wildlife rehabilitator. 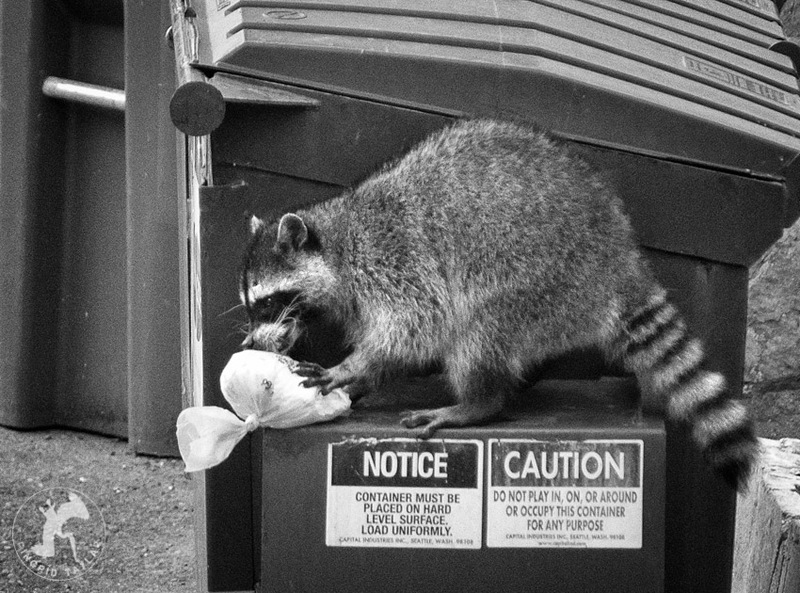 Raccoons raiding trash bins can bring out the worst in the human species. 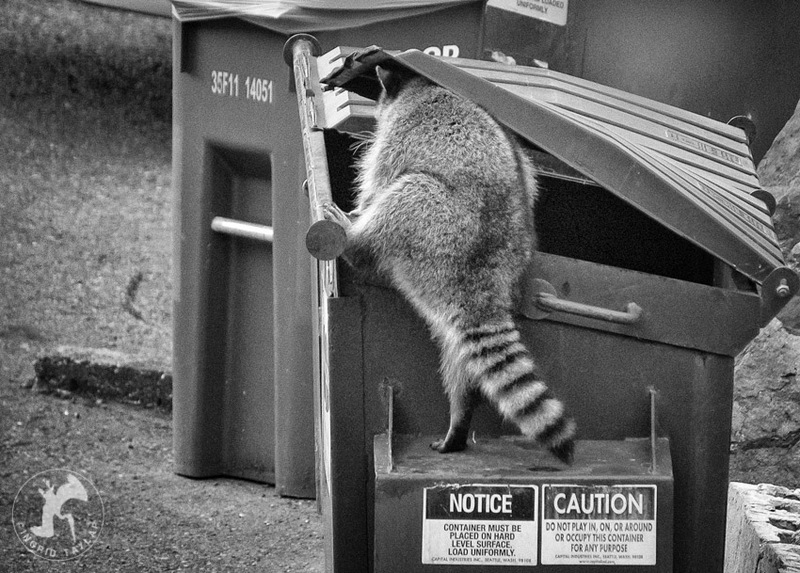 You can’t Google raccoon + trash without finding nasty posts — so don’t do it. I regret almost all of my wildlife Google searches. 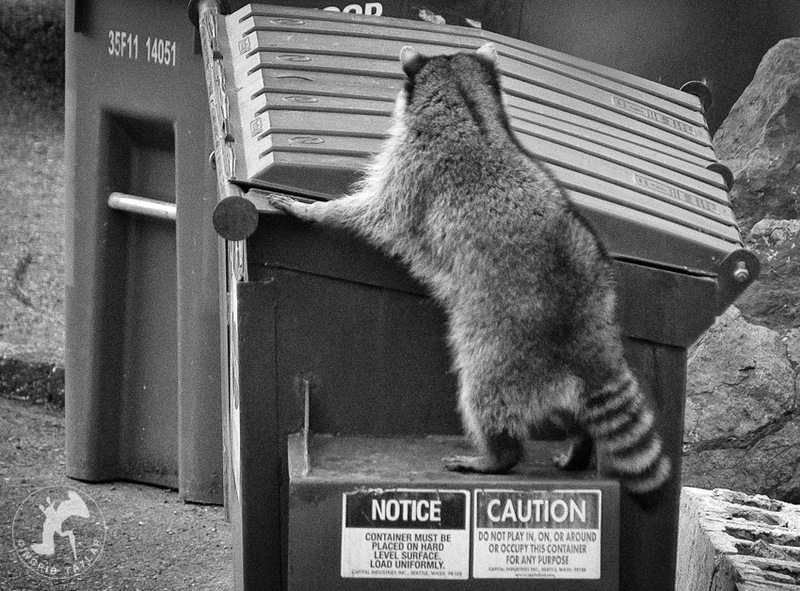 The truth is, we humans don’t secure our trash well and it’s only natural for an animal with the cleverness and dexterity of a raccoon to lift the lid and explore the worlds beyond. 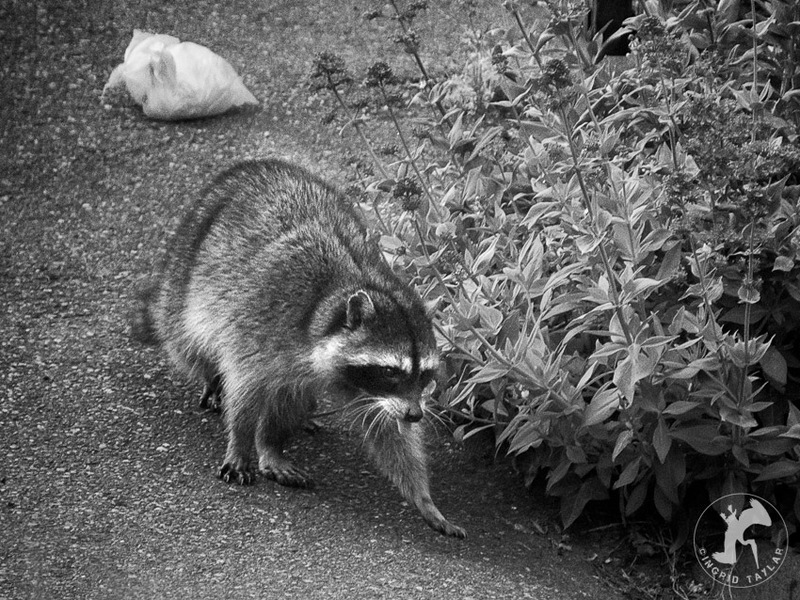 Wildcare in Marin has one of many pages you can find on the web, with suggestions for [humanely] keeping raccoons out of trouble on your property. 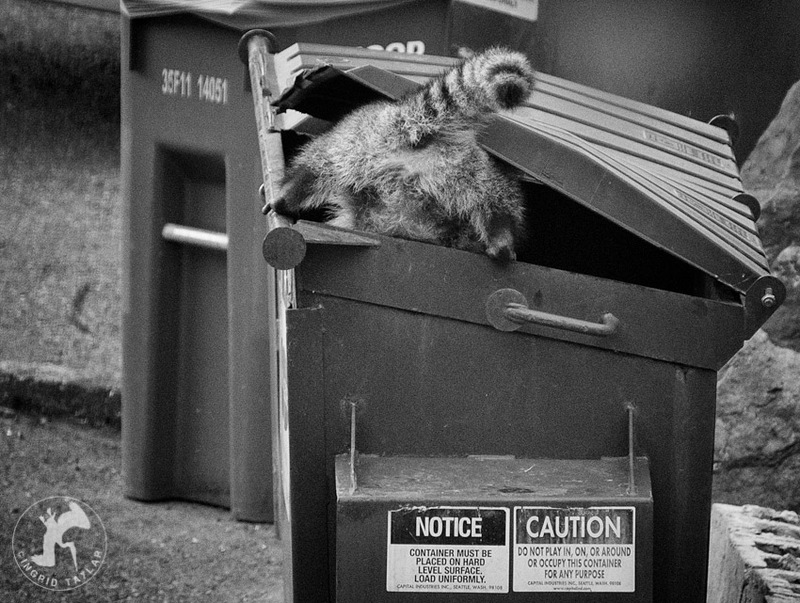 The two things that most concern me with raccoons and trash are the toxicity or danger of items they encounter, and the possibility that young raccoons will accidentally trap themselves under the lid. If you hear sounds coming from a dumpster in the spring time, take a look. There are always cases of people finding baby animals in the trash. The little ones simply don’t have the experience and size to get out properly, especially if the dumpster is empty and deep. Even this adult slipped a few times, but was big enough and skilled enough to pull herself back out. There are some very cute photos in this article from the UK’s Daily Mail, about baby raccoons getting rescued from dumpsters. This raccoon found a trash bag which, although you can’t tell here, was lilac and which I suspect (based on my unpleasant encounters with lilac trash bags) might have been perfumed. The raccoon gave it a long whiff and tactile exam before tossing it to the ground. After a few more looks under the lid, there was nothing more of interest for this raccoon. She trotted off, not at the 15mph she’s capable of, but in the casual amble of a local who knows her terrain … and pays not much attention to the overhead crows. As Snell-Rood and colleagues describe in an August 21 Proceedings of the Royal Society B article, museum specimens gathered across the 20th century show that Minnesota’s urbanized small mammals — shrews and voles, bats and squirrels, mice and gophers — experienced a jump in brain size compared to rural mammals. Snell-Rood thinks this might reflect the cognitive demands of adjusting to changing food sources, threats, and landscapes. “Being highly cognitive might give some animals a push, so they can deal with these new environments,” she said. Brain size is, to be sure, a very rough metric, one that’s been discredited as a measure of raw intelligence in humans. For it to fluctuate across a whole suite of species, though, especially when other parts of their anatomy didn’t change, at least hints thatsomething cognitive was going on. The conclusion isn’t quite that urban animals have larger cranial capacity over time, but it’s worth a read for this discussion. I’ve seen Racoons in Florida and I think they’ve had to pay a very high price for deforestation by losing their natural homes for the sake of human’s ever expanding ‘kingdom’. Thanks for the tips on what to do when they get trapped in the dumpster. You work on this theme of Urban Wildlife so well!